Want to mount a .30cal machinegun on the turret of your Sherman tank? We really don't have a lot of choices of guns to do so. Shown below is a scan of most of the pieces available to us, both from within kits, as well as a couple of aftermarket examples. Below the scan I include a couple of notes describing what we see. Mini World - I put the brass gun from Mini World at the top, because that is the finest example we have of the .30cal machinegun in this scale, and all others should be compared to it. Based on specifications I found on-line, this piece scales out almost perfectly to 1/72nd. Mini World also sells separate .30cal machinegun barrels in both a 2-pack and 10-pack. Dragon - The gun barrel on this piece was so delicate that it snapped when I tried to remove it from the sprue. Otherwise, this is probably the best piece we have available in plastic. It is included in Dragon's M4A3E8(76)W HVSS kit (#7302). 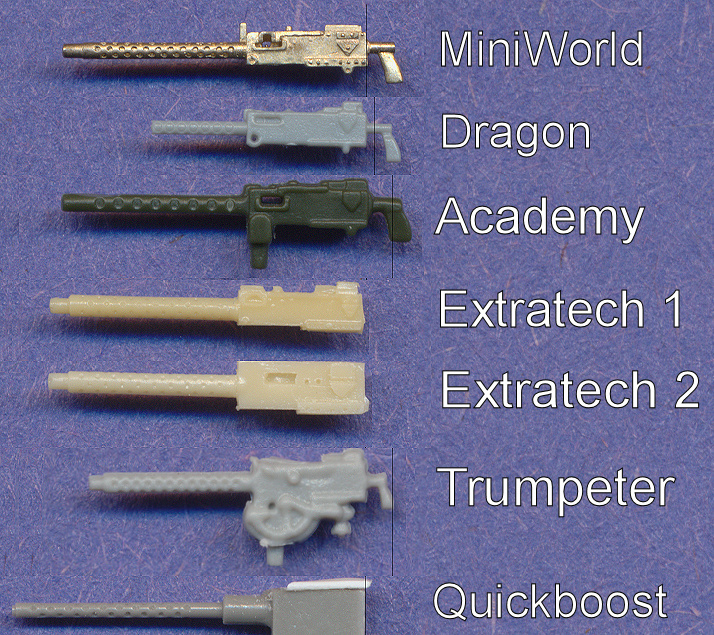 ExtraTech - #1 is included with Extratech's .30cal Machinegun accessory set (#72021), and #2 comes bundled with several of Extratech's tank destroyer kits (the ExtraPack versions). As you can see, the first version looks a bit more to scale than #2. Regardless, both of these are out of production, although Hauler has recently been releasing several older Extratech sets, so perhaps we'll see these available again in the future. Trumpeter - I had to do a little camera trickery with this one. You may recall that for some odd reason, Trumpeter chose to mold the ammunition box onto the side of the gun, but did so with the box sideways. The scan above shows the left sides of all the guns because the charging handle is on the gun's right side, and they would not lay flat on the scanner on that side. Since the ammo box was on the left side of the Trumpeter gun, I actually scanned the right side, and then mirrored the image for this comparison. We are actually looking at the details on the right side of the Trumpter gun above, just to show the level of detail seen on this piece. Its charging handle is actually on the correct side of the gun. Quickboost is a manucturer of resin detail parts for aircraft models. In their lineup is a set of 15 barrels for the .50cal machineguns on the B-25, which are perfectly suitable for replacing the barrels on any of the guns seen above. I originally bought these to replace the bow machineguns for my Shermans. Given how small these guns are, the lack of quality in the kit machineguns really isn't that big of a deal, unless you want the absolute best on your models. The brass gun from MiniWorld is the absolute best. Academy is a little large, and Trumpeter will take a little knife-work to clean up - and it's the smallest one of the bunch. Aside from the brass gun, I think they would all benefit from the Quickboost or Mini World replacement barrels.